Sunday is usually the night of the week that we have breakfast for supper, but on Friday night Nathaniel requested "chocolate chip pancakes like Christy makes." Christy is our dear friend who kept Nathaniel in her home daycare from 3 months old to 2 years old, and she made chocolate chip pancakes. You've met my son with the memory of an elephant, right? Yes, he remembers her pancakes. ... and the result was quite popular. I caught Nathaniel licking every last bit off of his fork several times. 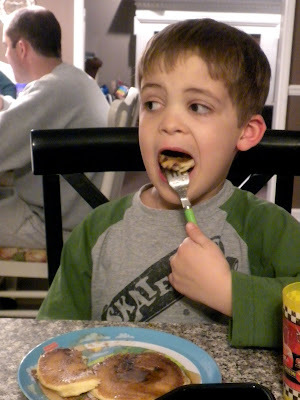 And Nick couldn't shovel the huge pieces of pancake into his mouth quickly enough. The first five or six pictures of him were even more blurry than this one because he was moving so fast. Jake ate his pancake quickly and was "aw duh," so I didn't get any pictures of him eating. He was out of the high chair before I even made it away from the stove. But breakfast for supper was a big hit! OK..I am laughing again. We have even more in common..two of my boys are named Nate and Jake to...we really do have a lot in common. and guess what? I found the recipe for the Chick fil a sauce...I will have to send it to you. I have not tried it..but it looks pretty easy.HAve a good day!!! You crack me up! And could you please mail me some pancakes. 1. I never use the left back burner. It's true. 2. Your family is lovely! 3. Thanks for the comment ;) they make my day!